Joseph Sekar’s day begins at 4am every day. He would wake up and start preparing food for more than 4000 visitors. 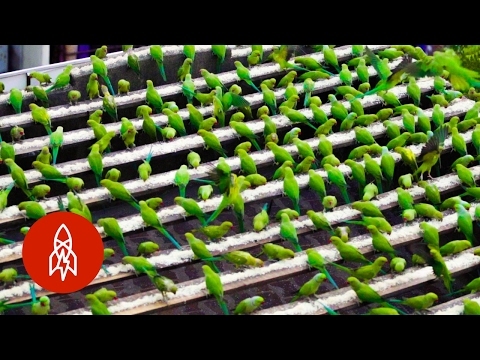 These are no ordinary visitors; these are wild parakeets who visit his home in Chennai, India everyday for food. Sekar has been feeding these birds for the last 10 years. This all began about ten years ago, when a tsunami struck near Sekar’s area and he noticed a pair of hungry parakeets hanging around his home. His humble gesture towards those birds has now turned more into a passion or more precisely his responsibility. Over the years, Sekar has been taking care of thousands of birds who visit him twice daily for their meals. Joseph Sekar is a camera repairman, who spends half of his daily wages in feeding these birds. Sekar has also rehabilitated sick and injured birds. He has cared more than 8000 parakeets in the last 10 years. Sekar, who is more popular as Birdman, is though uncertain how long he will be able to keep going his tradition.